I have read what feels like a zillion articles on yelling. I know yelling is bad. I know it hurts my kids and our relationship. But here’s a confession: I also haven’t totally stopped yet. I have been reflecting on this lack of alignment over the past few weeks. I realised that perhaps the reason I have not stopped yelling is because I haven’t created a plan for myself. If you want to stop a habit, after all, it is best to really work out the details of your situation, find alternatives, monitor changes over time, and celebrate progress. Like if you want to reduce sugar, you take note of what time in the day you are most attracted to the chocolate in the cupboard and instead of giving in to your temptation you plan ahead preparing alternative snacks. After choosing five fruit popsicles or mini containers of nuts and dried fruit during the course of a few days, you may then celebrate by having that chocolate bar. So I decided to set up a similar system for monitoring my yelling. 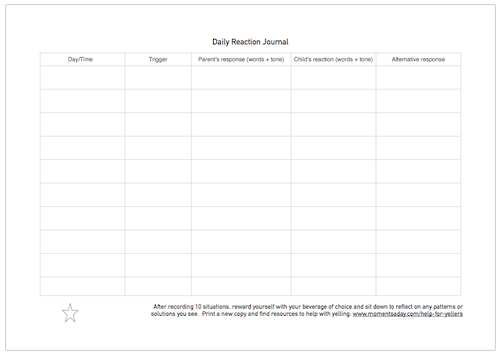 I created a simple Daily Reaction Journal where I can record more about my personal responses to my kids: identify any patterns (i.e. times of the day I tend to yell more), the triggers happening on a regular basis, what exactly I say, how the kids respond, and what I could have done instead. 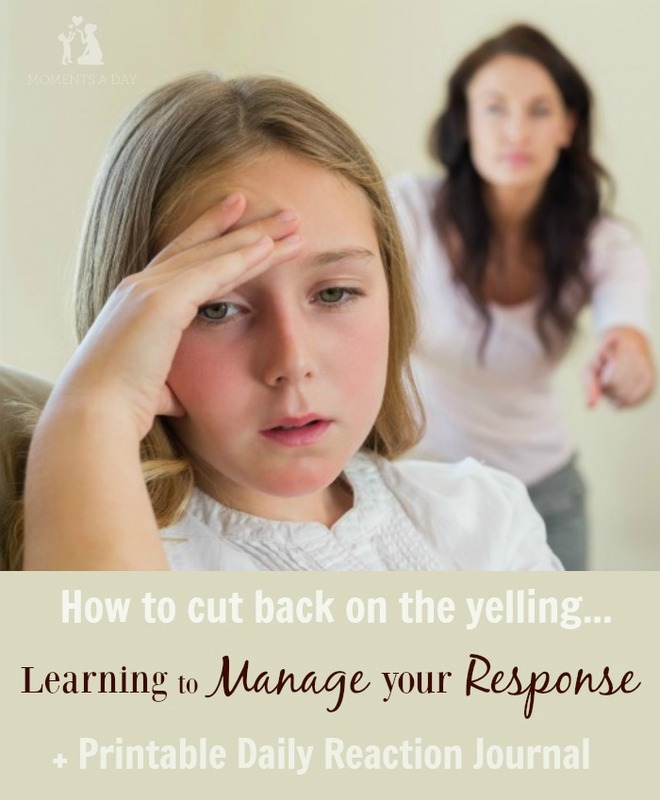 Although first I started out recording only yelling, I noticed over time that it was helpful to record all the notable interactions… such as when I did respond maturely and respectfully to my kids. Not only did these positive records give me a little boost but they have been helpful to solidify new tools, phrases and responses I can use again. Here’s the one-page super simple printable journal for you to use if you want to give this strategy a try. Click the photo to open up the PDF in a new tab. For me, yelling tends to happen more if we are rushing to get somewhere or when the kids are tired/hungry and therefore likely to argue with each other. The stress and frustration seem to put me on edge. I knew this before. But what I didn’t realise before the journal exercise was that I think I “shout” more than I “yell.” By shouting I mean barking directives such as “Get off that ledge before you fall!” or “Stop hitting!” Recognising this pattern has allowed me to brainstorm and try out alternative responses, so I can identify different ways to react to the same problem. I have also been able to notice a few reoccurring triggers which I have been able to modify so that I am not in the same position that I tend to yell in… such as being preoccupied with other jobs like filling out a form or making a phone call. This was obvious in retrospect, but not so obvious before writing it out and seeing a pattern. Knowing that these situations push me over the edge gives me the foresight to plan ahead better. 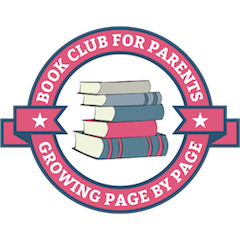 Giving the kids a reliable activity (such as LEGO and audiobooks) can keep them occupied while I need to do a quick job instead of just going with the flow and leading myself into a frustrating situation (where my kids need me when I’m trying to get something done). …and for some positive self-talk and self-care! Reading and re-reading articles about yelling provides motivation to keep working at changing this habit… it definitely isn’t easy! Are you a yeller? Do you know your triggers? What helps you keep your yelling in check?